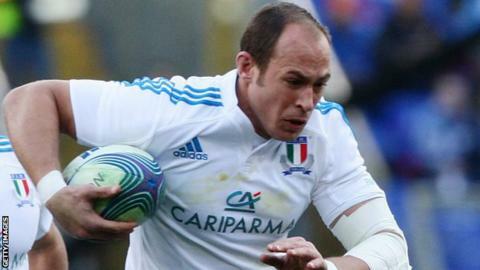 Italy captain Sergio Parisse is set to miss Saturday's Six Nations match with Wales in Rome because of suspension. The inspirational captain, who scored the first try in Italy's shock win over France, was sent off on Saturday while playing for club side Stade Francais. Parisse was dismissed for allegedly insulting the match referee in the Top 14 match against Bordeaux-Begles. A six-week suspension is the least Parisse, 29, can expect if found guilty of the offence at Wednesday's hearing. Any suspension would apply to the Six Nations, meaning the number eight would be in danger of missing all of Italy's final three games in the competition. Parisse's case is set to be heard before a French league disciplinary hearing on Wednesday. Under International Rugby Board laws that govern world rugby, the sanction for players found guilty of abusing a match official ranges from a six to 52-week suspension. Parisse was sent off after 36 minutes of Stade's home match with Bordeaux-Begles, having scored a try in the fourth minute. The 33-year-old was left out for the games against France and Scotland. Italy stunned France 23-18 in Rome but was overwhelmed 34-10 by Scotland at Murrayfield.